The topic of mentorship is a predominant theme in professional literature, with important perspectives shared on mentorship in areas such as academic promotion, management, and executive leadership. Mentorship is also an important topic in gaining experience in publication, and developing expertise in writing contributes to professional success across professional roles. Similar to other mentorship opportunities, the sharing and receiving of knowledge regarding publication is an art and also an endeavor in which both mentor and mentee can benefit from guidance. In this article, we share our experience over the past 7 years in providing a writing mentorship program and tips for both partners in such a process. Our experience is based on a writing mentorship programs provided through the Journal of Hospice and Palliative Nursing (JHPN). The journal will soon celebrate its 20th year anniversary and serves as the official journal of the professional organization for this discipline, the 12,000-member Hospice and Palliative Nurses Association (HPNA). Palliative care nursing represents a field ripe for opportunity for writing mentorship. 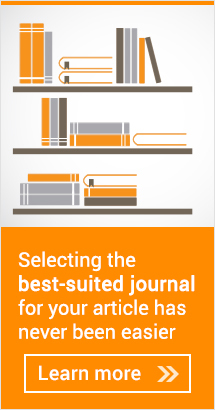 The members of the organization and readership of the journal are often novice writers. They are largely expert clinicians providing bedside care, and they are doing important work caring for seriously ill or dying patients and building a new discipline of nursing practice. Their stories are important, and publishing their work is a key element of advancing the field. Our mentorship program was launched in 2011 based on requests from authors for support as well as from our observation of the need for mentorship. JHPN is published 6 times per year with approximately 12 articles per issue. The journal includes one paper per issue devoted to a symptom management topic and one paper on a topic related to ethics. These two invited paper series are the only solicited articles. Due to our limitation of only 6 issues per year, we do not publish editorials or personal reflections, thus the remaining 10 articles per issue are original unsolicited manuscripts. The fact that our readership/authors often work in hospices or other settings in which there are few writing mentors available was another reason we decided to initiate a writing mentorship program. Many JHPN contributors are first-time authors. The writing mentorship program is announced through the HPNA, the journal website and print edition, and other journal and organization communications. 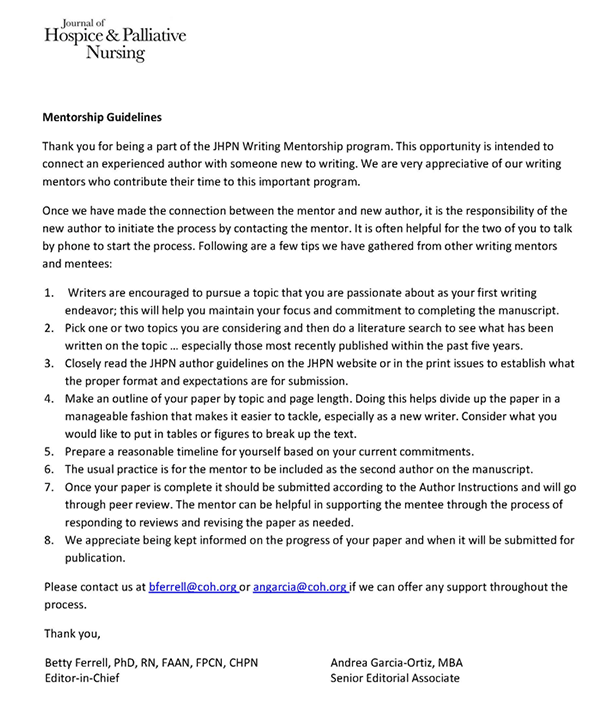 Mentors are recruited through announcements in the journal and through the HPNA, and many of our journal reviewers also serve as writing mentors. This has been valuable as they can also share their experience as reviewers and support mentees through the submission process. Thus far, a total of 94 writing mentors and mentees have been paired through the program. Our experience over time has been that both mentors and mentees often need some structure and guidance in the mentorship experience. Below is the information sent to each mentor and mentee. The writing mentorship process may not always result in a submitted manuscript. Often, mentees are not aware of the time commitment required to produce a quality manuscript and nurses in clinical settings rarely have any time dedicated for writing. However, our mentors understand that the process is still valuable, and the mentees benefit from collegial support and through gaining appreciation for the publication process.